By Lindell Ross. ISBN:1514808862; CreateSpace Independent Publishing Platform, 2015; 210p. ; illustrations. This book is a humorous collection of poems which briefly summarise the main themes of Western frontier history. 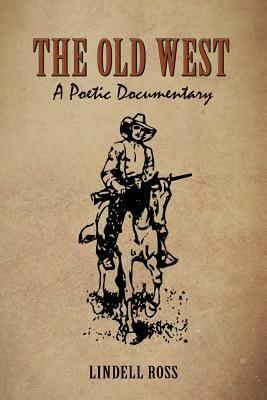 There are one hundred poems each telling a story and covering in total sixteen topics, including Pioneers, Gunfighters, Soldiers, Gamblers, Railroaders, Miners and so on. The verses, often quirky, are a mixture of free and rhythmic lines. If you care for poetry, these verses could give considerable pleasure and make you smile. There is no profound or serious element among them, but there are often subtle ironies which mix cleverly with the humour while covering the main facts of each theme. Lindell Ross is a member of the “Maverick Corral” of the Westerners (In Westerners International parlance that’s a member who does not live near or is a member of an active Corral but who receives the Newsletter etc.) His childhood was in Missouri where he developed his interest in Western history. He would travel widely in the West and seek out many places having historical connections with events in frontier events. (In Missouri itself, for instance, two of his uncles had the names Frank and Jesse and in later years he would visit such places as the Meramec Caverns which Jesse James used as a hideout.) Much of Ross’s retirement was spent in Colorado, both travelling and on a ranch where he was at home on the range as a ranch cook in the day and poet during evenings! He has a B.A. and M.A. from Michigan State University.